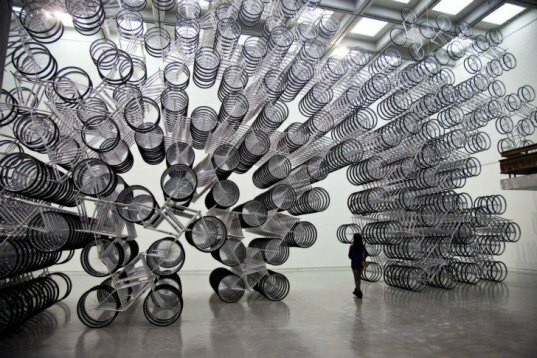 Cycling is one of the most common forms of transportation in China, but Weiwei removes their primary function and makes them static. Cycling is one of the most common forms of transportation in China, but Weiwei manipulates the bicycles by removing their primary function and making them static. The freedom associated with cycling is lost and the bicycles are piled together in a labyrinth-like way that renders them useless and immobile. Visitors can stand below the installation and see each detail from a new angle, gaining a new perspective on the bicycles and reflecting on their meaning. The show assembles 21 exhibits of the artist’s work in total, including the display ‘Circle of Animals/Zodiac Heads’, which consists of a series of large bronze animal heads staked on posts in a circular formation. The installation works within the context of historical dispute and tradition in China. Weiwei created the exhibition following a four month political detention for allegations of economic crimes. The artists’ brilliant work often has a social or political subtext, and continues to receive huge amounts of attention worldwide. 12,000 bikes, now forever consigned to the most wasteful, pretentious and pointless exhibit that inhabitat has ever featured? Seriously? How can he afford stuff like this? Visitors can stand below the installation to gain a new perspective on the bicycles and reflect upon their meaning. The freedom associated with cycling is lost and the bicycles are piled together, rendering them useless and immobile.